On Monday, the Spider-Man: Into the Spider-Verse mobile web AR experience was launched for mobile web browsers on iOS and Android devices. Visitors to the special site can summon the Miles Morales version of Spider-Man into their very own plane of existence (assuming that user grants camera permissions to the site). "Spider-Man is a perfect match for AR not only because his acrobatic moves and iconic poses lend themselves well to the format, but because he's one of the most relatable superheroes," said Rose Phillips, senior vice president of digital marketing at Sony Pictures Entertainment, in a statement provided to Next Reality. "We're excited to collaborate with 8th Wall, Amazon Sumerian and Trigger on Spider-Verse Web AR Experience and bring it to all — and new — Spider-Man fans." The experience was developed by augmented reality ad agency Trigger. 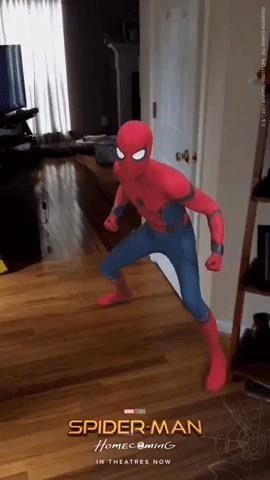 During the AR experience, Spidey does a couple of poses, and tapping on the screen re-spawns him on the area corresponding with the area of the screen the user touches. 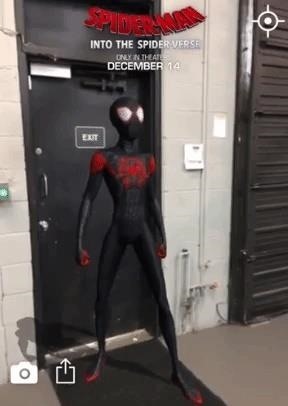 Users can also snap a photo of Spidey and share the AR experience with others. But after that, that's about it. Comparatively, the Spider-Man: Homecoming pack on the Holo app (also developed by Trigger) offers a lot more in the way of Spidey poses. Therefore, it's a bit disappointing that fans can't summon multiple versions of Spider-Man for the new Spidey AR experience, especially when you remember that seeing "multiple versions" of Spider-Man is the premise of the new animated film. Nevertheless, in a year where Hollywood has tightly embraced augmented reality as a marketing tool, this particular promotional AR experience is remarkable for a couple of reasons. First, instead of Snapchat, Facebook, or even a dedicated AR app, Sony opted to leverage 8th Wall Web, the web-based, markerless AR technology from 8th Wall that works on both iOS and Android devices and allows the studio to easily avoid the hurdle involved in convincing viewers to install an app of any kind. 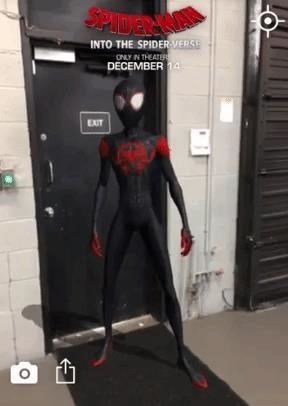 "The Spider-Verse Web AR Experience demonstrates how established brands can dramatically enrich their customer experiences and better engage with their fans," said Erik Murphy-Chutorian, CEO at 8th Wall. "Augmented reality allows consumers to dive deeper into the worlds of their favorite products and characters. Sony Pictures has deepened and enriched the Spider-Man experience with the innovative work they've produced with Trigger and 8th Wall, and powered by AWS. It's the perfect example of how AR for the web is the best new medium for brands to make their content come to life while increasing the accessibility and interactivity of their stories." The second unique aspect of this AR experience is the content itself, which was built on Amazon Sumerian, the web-based 3D content creation tool introduced a year ago by Amazon Web Services at its re:Invent development conference. Amazon launched the tool as a way to make it easy for anyone without coding experience to create augmented reality experiences. "Mobile Web AR is making possible for Sony Pictures to bring people into the world of Spider-Man and engage with the character like never before," said Kyle Roche, general manager of Amazon Sumerian and Amazon Web Services (and NR30 member). "Using Amazon Sumerian, the teams at 8th Wall and Trigger were able to deliver an immersive browser-based AR experience and do so without any specialized programming or 3D graphics expertise. Together with Sony Pictures, we're changing the way fans experience their favorite web-slinger." As augmented reality continues to gain favor among marketers, Trigger is a name to keep an eye on. The company already lays claim to a number of notable AR experiences, including the NBA AR app, the Rampage: AR Unleashed app, Travelocity's AR Roaming Gnome, Star Wars AR Stickers on Google Pixel, and many more. "Spider-Man is in our DNA. My team has been a digital developer since the first Spider-Man film and Trigger has been developing AR for Spider-Man properties at Sony Pictures since 2014," said Jason Yim, CEO and executive creative director at Trigger. "We believe Web AR is the final barrier for mass adoption of AR ... Web AR will not only become the first entry to AR for most audiences, but it will build a foundation of behavior that will lift adoption in social, mobile and head-mounted AR."